AWazDat Christmas available for free! AWazDat is available on the App Store! My one year old son always looks at my iPod and says "awazdat" (ahh what's that?). He loves to click on icons, shake the iPod, and listen to the sounds it makes. AWazDat was created just for that purpose. The icons in AWazDat are fun animals and objects. They move as the iPod/iPhone is rotated. When the icons are touched they grow and play fun sounds related to the icon (pig oinks, train blows whistle, etc.) to provide visual and auditory feedback to your little ones . The sounds alternate between the name of the icon and the fun sound. If your little one shakes the iPod/iPhone the background will change color and the color will be spoken. 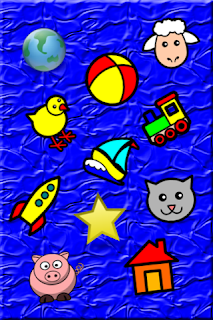 AWazDat is a great app to keep little ones entertained!